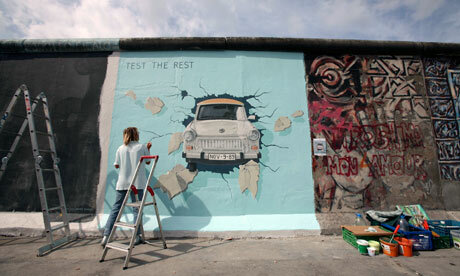 In papers due to be filed at a Berlin court this week, the artists say they â€“ and about 80 other painters who decorated the wall shortly after the borders between east and west were opened in November 1989 â€“ were offered â‚¬3,000 (Â£2,700) each by Berlin council to recreate their original murals after the site was overhauled for the 20th anniversary of the fall of the wall two years ago. The artists were told if they refused to comply, an urban renewal firm contracted by the council would whitewash their work and get someone else to re-create â€“ or “forge”, according to the aggrieved artists â€“ the originals. It is not unlike a London borough destroying a piece of Banksy graffiti and then getting it re-created in order to keep the tourists coming. Many of the Berlin artists deemed â‚¬3,000 an insultingly low amount, especially as it was public knowledge that Berlin council had put aside a total of â‚¬2.2m for the renovations. Hannes Hartung, a Munich-based lawyer representing artists in the legal action, said Thierry Noir, one of the artists who contributed to the East Side Gallery, had successfully won â‚¬250,000 from Germany’s highest court after a section of the wall he painted was sold to a private collector. Bodo Sperling, one of the founders of the East Side Gallery, whose work was whitewashed two years ago, is demanding at least â‚¬25,000. Sperling and 18 others who refused the â‚¬3,000 and then watched their work being destroyed are suing the council. They said they would be happy to repaint their designs â€“ for a fair price. Ever since they threatened legal action during the renovation process two years ago, their sections of the wall have remained blank. Two other artists have launched a claim for intellectual property theft after their original paintings were re-created by the council when they turned down the city’s offer. Carmen Leidner Heidrich’s Niemandsland (No Man’s Land) and Die Geburt der Kachinas (The Birth of Kachina) by Hans JÃ¼rgen Grosse were both “forged” against their creators’ will. The original East Side Gallery was created just after the Berlin Wall fell in 1989 as a project to bring creative minds from both sides of the divide together. More than 100 artists from east and west contributed work, forgoing any fees in the spirit of peace. Millions of tourists who visited the reunited city took snaps of the free gallery, especially the famous painting of Leonid Brezhnev and Erich Honecker kissing and another of a Trabant car appearing to burst out from the wall. The artists responsible for both of these paintings accepted the â‚¬3,000 to repaint their designs and are not part of the pending legal action. Others, though, are furious. “The artists believe that the renovation has created a Disneyland for Berlin and they have never been paid for it,” said Hartung. He said a private urban renewal company employed by Berlin council wrote to the original artists a few years ago, announcing that the gallery was to be renovated in order to mitigate the effects of weather, pollution and vandalism. “The letter gave them a choice: either they accepted â‚¬3,000 to repaint their original artworks or the city of Berlin would destroy them and get someone else to recreate their designs â€“ and they wouldn’t receive a penny,” the lawyer said. The claim is due to be filed in a Berlin court on Wednesday, although the case is unlikely to be heard for at least three months.